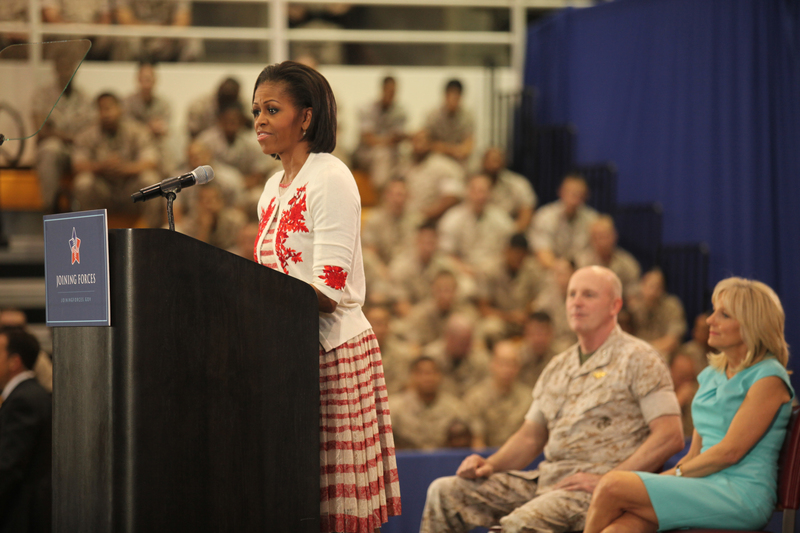 Michelle Obama at Camp Lejeune… but did she say Luh-jern? You are at:Home»Camp Lejeune»Michelle Obama at Camp Lejeune… but did she say Luh-jern? First Lady Michelle Obama and Dr. Jill Biden, wife of Vice President Joe Biden, stopped in at Camp Lejeune, N.C. today for about three hours as part of the launch of their “Joining Forces” campaign to support America’s uniformed troops and their families. Before a crowd of more than 3,000, the two women took the stage at Goettge Memorial Field House to rousing applause, and spoke of their support and admiration for Marines and their famlies. It was the first visit for Obama, but not for Biden, who demonstrated her kinship with the Marine Corps by letting out a hearty “oorah!” at the microphone. Afterward, the Obama and Biden team joined lifestyle maven Martha Stewart at the Ball Center for a mass baby shower for 40 pregnant women, Marines and Marine wives, whose husbands are deployed. The event was given by Operation Shower, a non-profit support organization, and the women received scrap booking lessons from Stewart and donated gifts. Joining Forces was launched by Obama and Biden on Tuesday in Washington, D.C., and Lejeune was their first of several stops to raise awareness. A web site offers more information. “We’re extremely honored that the first lady would consider the home of the Carolina MAGTF to launch her joint initiative in support of military families,” said Camp Lejeune spokesman Nat Fahy, who is a veteran of the complicated process of preparing for a visit from a high-level person. “We were fortunate to have a blueprint for this type of visit,” he said, recalling the January 2009 visit by newly inaugurated President Barack Obama who announced his war strategy for Iraq at Camp Lejeune. “It was a matter of dusting off the playbook and accommodating the first lady’s agenda,” he said. But did the first lady of the United States acquiesce to the wishes of a movement within, and without, the Marine Corps to return to the Lejeune family’s pronunciation of its name: Luh-jern? AFTER ALL THE BULL THAT THE OBAMA ADMINISTRATION HAS DUMPED ON THE MILITARY, DADT AND SUCH AND NOW THE FULL CAMPAIGN MODE IS ON WITH A NEW INITIATIVE . YOU JUST GOT TO BE KIDDING ME. MYSELF, I’M APPALLED BY THESE SELF SERVING, PHONIES WHO APPARENTLY HAVE NOTHING ELSE TO DO. A great way to help military families is to ensure access to job opportunities. The Dept. of Defense has a free program called the Employer Partnership of the Armed Forces which offers thousands of career opportunities with military-friendly employers in every state and territory. The program is open to Family members, Reserve/Guardsmen and veterans. It’s like a Monster dot com for the military. Build a resume in the system and a job may even find you. This is a great resource so pass this info on- Thanks! Kaniya Knight in the grey dress was in the tornado in the Piney Green neighborhood of Jacksonville. She is well but her home is not safe for living. For us to see this in the Marine Corps Times today gave our family great pleasure at a very difficult time. We are lucky to have our lives. Kaniya is also pregnant with two devil pups, young marines….boys. This pic does not do justice in person Martha Stewart is flawless, Michelle Obama looks like a live barbie doll and Jill Biden is beautiful. my opinion is there is nothing better then this check my website and you’ll see what i’m talking about.